The Princess cruise lines have a special treat for their passengers: Princess Cays, a resort exclusive to Princess cruises itineraries. It is located in the Bahamas, in the Southern portion of the Island of Eleuthera. Most itineraries on Princess will stop here for the day. You'll find everything you need for a wonderful time at the beach. The crew gets on the island first to bring all the food for the lunchtime BBQ. Then you'll be taken ashore by tenders going back and forth all day long. You can try a variety of watersports, such as snorkeling, sailboats (Hobie Cat and Sun Fish), aqua bikes, ocean kayaks, paddle wheelers and of course the always popular banana boat. 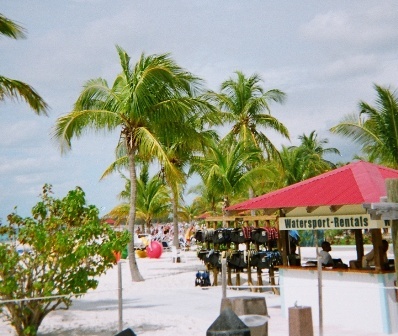 You can reserve any of the watersports as well as snorkel equipment in advance at the tour desk on the ship or you can do it on the beach at the watersports hut. Just present your cruise card and it will be charged to your cabin. You'll have a beautiful white sandy beach here that extends for miles on either side of the tender area. Chairs are available for free all along the beach. For the best snorkeling, walk left of the marina and all the way past the offshore pavilion, and go in the water right off the last little tiny beach, down the steps and snorkel your way to the pavilion. It is one of the best snorkeling I ever done, and we've been on many islands. What else can you find on Princess Cays? Shopping: that's right...you can even buy tropical gifts and souvenirs. You can charge anything you buy in the Tropical Treasures and the Bahama Treasure Gift Shop boutiques to your cruise card. On the other hand, you need to pay cash if you buy from the local vendors that are set up on the beach as well. Food: as mentioned before, you will find a 'casual' lunch on the beach, featuring burgers, hot dogs, chicken, salads, cookies and condiments. If you would rather eat on the ship, there is always time to take a tender back to the ship and you can return in the afternoon, just remember what time the last tender is. Drinks: there are three bars to serve you. Again, you can charge to your shipboard account. 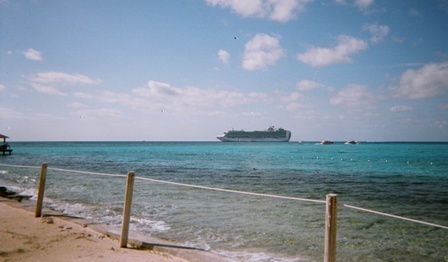 Princess Cays is a highlight amongst the many Princess cruises shore excursions. I hope you'll enjoy your day there as much as we did.